There is an evidence that the crustal thickness from the Red Sea coastal plain to the interior of Saudi Arabia increases dramatically from 10 km in the Red Sea to about 42 km. 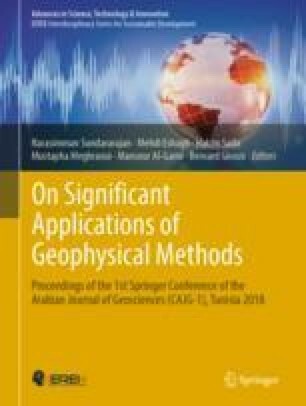 In order to give more insights on crustal configuration of the Arabian plate, we proposed to analyze available gravity and aeromagnetic data. The gravity data was analyzed and interpreted within a profile A-B perpendicular to the Red Sea coast along the western margin of the Shield. The analysis included the construction of Bouguer gravity and residual anomaly maps, regional gravity and magnetic anomaly maps based on wavelength filtering and derivative techniques, and 2.5D gravity models were constructed in an integrated method constrained by surface geology and previous work such as the available seismic refraction and broadband models [Hansen et al. in Earth Planet. Sci. Lett., 2007 1]. Our observations of lithospheric structure showed a relative complexity of the gravity and aeromagnetic anomaly controlled by structural complexity and variable lithology of the transect and support a two-stage rifting history along the Red Sea and suggest that the Moho and LAB topography is the result of extension and erosion caused by asthenosphere flow where the thinnest lithosphere is coincident with the rift axis.